Paul Jordan :: PATIENCE AND HARD WORK PAYS OFF! A thrilling courageous win by Chinetti represents hours of hard work and the racking of many brains by my staff and our engaged veterinary surgeon, Paul O'Callogan, to obtain yesterday's result. So many thanks goes out to all those people and especially a warm thank you to his many owners who kept faith in the process when there were dark times and sometimes the feeling of just giving up and letting the horse retire. On a brighter note, we will look forward to a similar race in a few weeks. 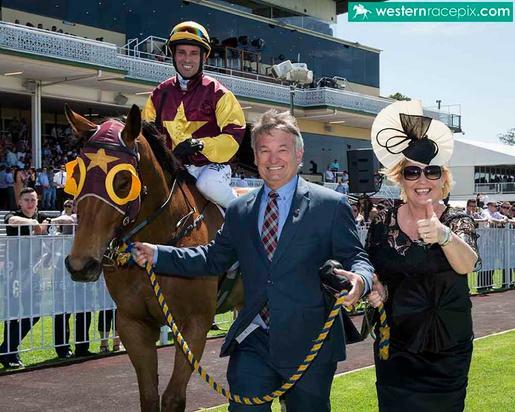 The photo shows Chris and Janine Chalwell leading Chinetti back to scale.